Depression is a condition in which a person feels discouraged, sad, hopeless, unmotivated,or disinterested in life in general. If these feelings last only for a short period of time, it may simply be a case of “the blues.” But when such feelings last for more than two weeks and when the feelings interfere with daily activities such as taking care of the family, spending time with friends,or going to work or school, it could be a major depressive episode. Types of depression: There are three main types :Major depression, dysthymia,and bipolar disorder can occur with any of the anxiety disorders. Major depression involves at least five of the symptoms above for a two-week period. Such an episode is disabling and will interfere with the ability to work, study, eat, and sleep. 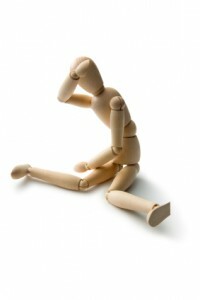 Major depressive episodes may occur once or twice in a lifetime, or they may re-occur frequently. They may also take place spontaneously, during or after the death of a loved one, a romantic breakup, a medical illness, or other life event. Some people with major depression may feel that life is not worth living and some will attempt to end their lives. Dysthymia is a less severe, long-term, and chronic form of depression. It involves the same symptoms as major depression, mainly low energy, poor appetite or overeating, and insomnia or oversleeping. It can manifest as stress, irritability, and mild anhedonia, which is the inability to derive pleasure from most activities. People with dysthymia might be thought of as always seeing the glass as half empty. Bipolar disorder, once called manic-depression, is characterized bya mood cycle that shifts from severe highs (mania) or mild highs (hypomania) to severe lows (depression). During the manic phase, a person may experience abnormal or excessive elation, irritability, a decreased need for sleep,grandiose notions, increased talking, racing thoughts, increased sexual desire,markedly increased energy, poor judgment, and inappropriate social behavior.During the depressive phase, a person experiences the same symptoms as would a sufferer of major depression. Mood swings from manic to depressive are often gradual, although occasionally they can occur abruptly. Several forms of psychotherapy are effective. Of these, cognitive-behavioral therapy (CBT) works to replace negative and unproductive thought patterns with more realistic and useful ones. These treatments focus on taking specific steps to overcome anxiety and depression. Treatment often involves facing one’s fears as part of the pathway to recovery. Interpersonal therapy and problem-solving therapy are also effective. Medications can also be useful. Symptoms of depression and anxiety disorders often occur together,and research shows that both respond to treatment with selective serotonin reuptake inhibitor (SSRI) and serotonin norepinephrine reuptake inhibitor (SNRI) medications. There are other medications which may be used if an SSRI or SNRI does not provide improvement. For many people,combining psychotherapy and medication isthe most effective treatment.